The following is adapted from the introduction to “The Riddler: Fantastic Puzzles from FiveThirtyEight,” published by W. W. Norton & Co. It is in stores today! Those secrets were whispered in the language of mathematics. The front of the Rhind papyrus. The problems posed in the Rhind papyrus won’t present much of a challenge to the modern reader — especially for you numerate readers of this website. One of its problems, for example, reads, “Find the volume of a cylindrical granary of diameter 9 and height 10.”1 Another: “Sum the geometrical progression of five terms, of which the first term is 7 and the multiplier 7.”2 But now they serve a grander purpose. 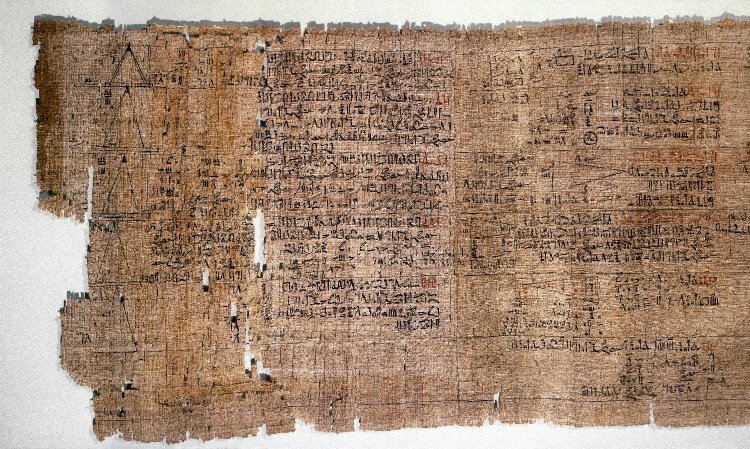 The 84 problems and solutions recorded on the papyrus provide some of the clearest insights into the numerical methods of the ancient Egyptians, some of the world’s earliest mathematicians. 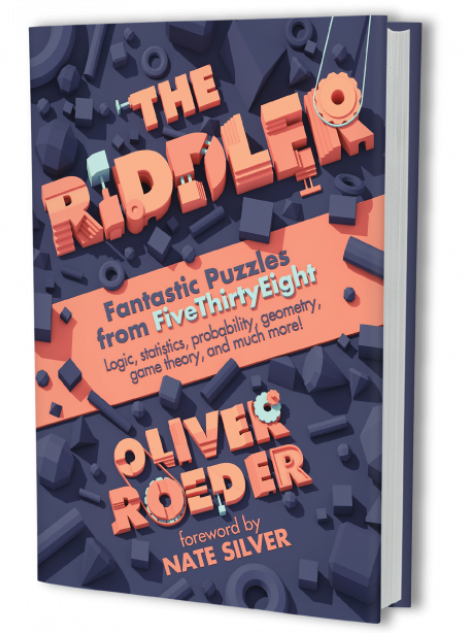 Today, we’re publishing the first-ever collection of Riddler puzzles in a book. The puzzles in the collection originated not from a dutiful ancient scribe but often from people like you. Each Friday, when the column is published, Riddler readers take to the far-flung boroughs of the internet to dissect, discuss and solve the puzzles of the week. It shows how great strides have been taken in mathematics over these past 3,000 years and the strength of technology to accelerate, combine and disseminate ideas. That’s precisely how I feel about the readers who have contributed to the column. The Rhind papyrus is one of the oldest collection of math puzzles. This book is one of the newest. The Riddler book is a physical testament to that collaboration. Within the book are dozens of puzzles and solutions selected to appeal to a spacious breadth of mathematical interests and a bottomless depth of mathematical skills. The simplest require a mere flash of logical insight. Others draw on the tools of trigonometry, geometry, combinatorics — and even a bit of calculus. The toughest involve deep applications of analysis and probability theory. All of them are meant to be fun. In the ancient Egyptian papyrus, the puzzles concerned the arithmetic of the practical: granaries, flour, beer, bread. The puzzles here go a bit further afield. Each has a story — perhaps set in a dystopian city, a sunny park, or a basketball arena, to name a few. (You will also find two puzzles about pizza, without which no puzzle book is complete). As I culled the published columns and assembled brand-new Riddlers for the book, the puzzles tended to fall into three broad mathematical categories: logic, probability and geometry. In the first category, you might find yourself rigging an election, outwitting a car salesman or competing in a space race. In the second, you may be fending off an alien invasion, visiting a national park or teaching your baby to walk. And in the third, you might be baking a cake, outrunning an angry ram or fighting over pizza with your siblings. While there may be right and wrong answers to the puzzles, there is no right or wrong way to proceed through the book. If you are presented with a problem about pizza, say, perhaps you’d do well to pull out a pencil and paper and just get to it. Or maybe you’d be more comfortable on your computer, running some pizza simulations. Or maybe you find a hands-on approach is best, and you order up some actual pizzas to test your hypotheses. In any case, I hope you buy the book and continue this digital collaboration in the physical world. Adapted from The Riddler by Oliver Roeder. Copyright © 2018 by ESPN, Inc. Used with permission of the publisher, W.W. Norton & Company Inc. All rights reserved. As you have no doubt already calculated, the volume is about 636 cubic units.